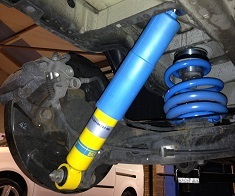 This is the best coilover package available for the VW Transporter T5 and T5.1, giving improved handling and performance. They are manufactured in Germany ensuring high quality and reliable performance. All T5 & T6 - Please choose appropriate option for your vehicle from the drop down list. *Fitted option includes fitting in our workshop. Item will not be delivered to customer. Please contact us to check available dates for fitting before purchasing.